Exports all the database objects like tables, rules, triggers, functions, etc. "Brilliant software for SQL data migration to cloud server applications. No drawbacks, and a completely secured SQL Migration tool." "Liked the UI very much. 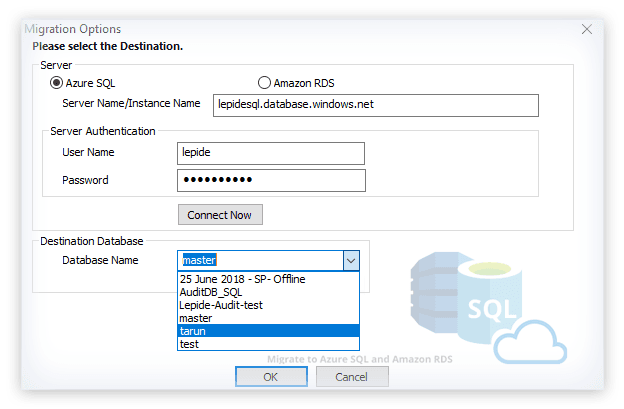 I migrated my SQL data to Amazon RDS using only 3-4 steps. Instant and efficient software."" "Impressed by this SQL migration software design and features. Best I liked is that it migrates selected objects to the destination." "Great to know that I can migrate my corrupt SQL data so easily to the Azure SQL Server. Hats off to the creation." With this SQL Migration tool, you can migrate both damaged and healthy SQL Server MDF or NDF files. It supports all sort of database files (protected, inaccessible, damaged, lost) for migrating the data residing in them. SQL database migration software migrates all SQL Server database objects like rules, triggers, tables, function, views, primary keys, indexes, unique keys, stored procedures, foreign keys, default values, checks, and user data types. 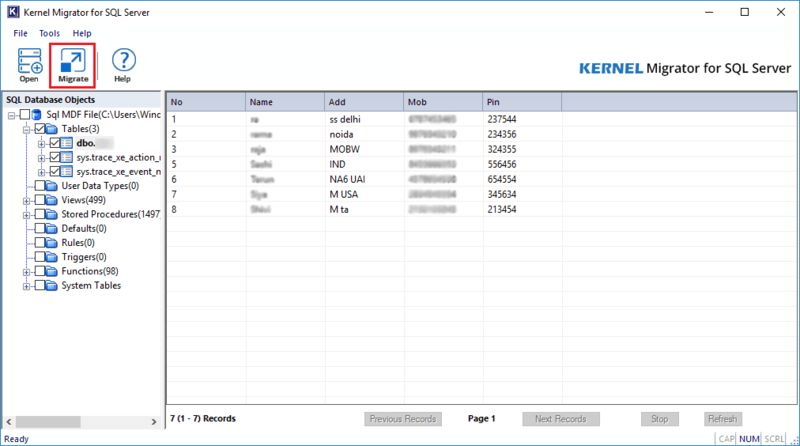 For scanning the corrupt SQL database files, the software possesses two scanning modes – Standard Scan & Advanced Scan. With these two scanning modes, you can migrate even highly corrupt SQL database files. SQL Migration tool has an in-built Preview feature which allows viewing the SQL database objects before migration. 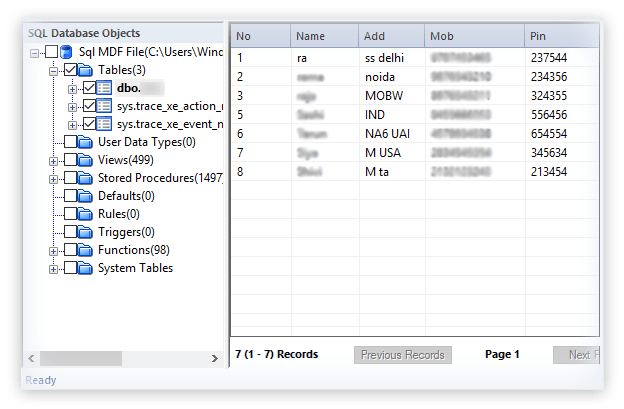 Just by selecting the database object on the left-pane, users can see its content on the right-pane. On the preview pane, you can select the objects for the migration too. 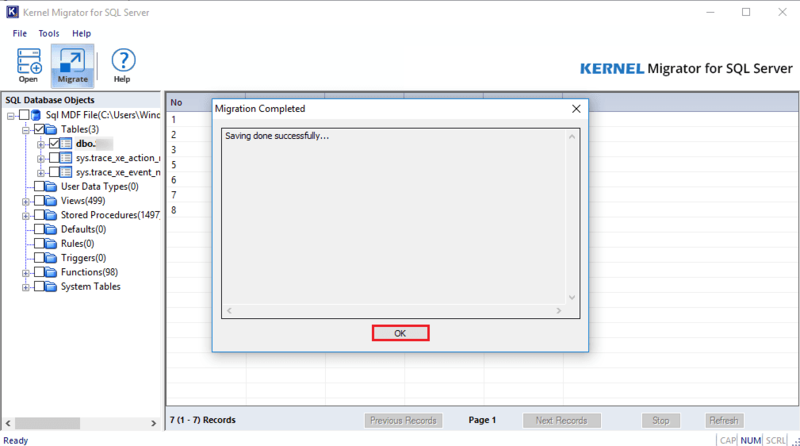 To understand the migration process, users can try the free version of SQL Migration tool. It has all the features of the tool - it scans the SQL database files and shows the preview of the content but cannot perform the migration. For performing migration, you will have to purchase the full version. It upholds the integrity of the SQL data during and after the migration. The data remains intact and secure until it gets saved at the desired destination. The software provides two saving destinations for the SQL database file. 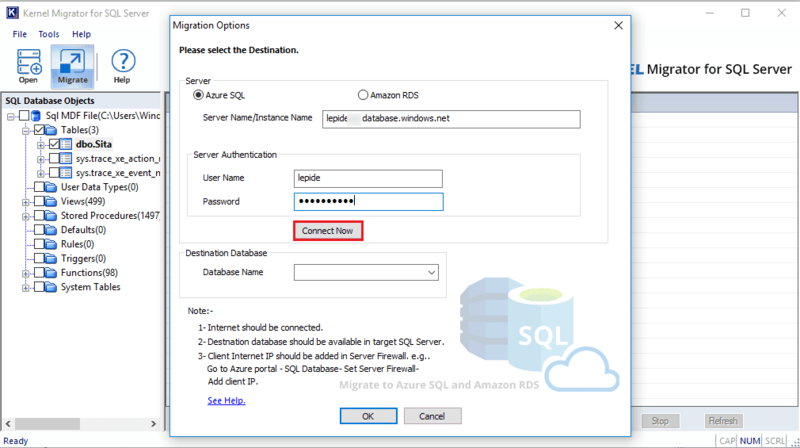 You can migrate the SQL data either to Microsoft Azure SQL Server or to Amazon RDS (by providing the server name and user credentials). The software supports all versions - SQL server 2017/2016/2014/2012/2008 R2/2008/2005/2000, Windows 10/8.1/8/7/Vista/XP/2000, & Windows Server 2016/2012 R2/2012/2008 R2/2008/2003 R2/2003. 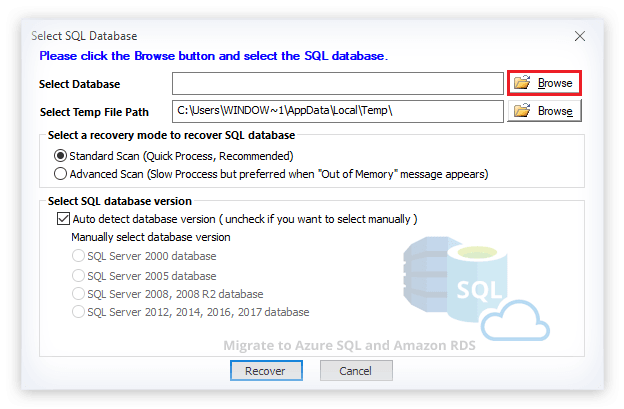 Please provide the steps for migrating SQL database to Azure SQL Server. Can I migrate some data using the trial version of the tool? No, you cannot migrate any data using the trial version of SQL Server Migration tool. However, you can have a preview of the added SQL Server database file. Which SQL Server versions are supported by the tool for the migration? The software supports all the SQL Server versions including SQL server 2017/2016/2014/2012/2008 R2/2008/2005/2000. Do I need to select the SQL Server version of the MDF file manually? SQL Migration software has a feature that automatically detects the SQL Server version. But if it fails to detect the version or you want to add the version manually, you can do it manually. 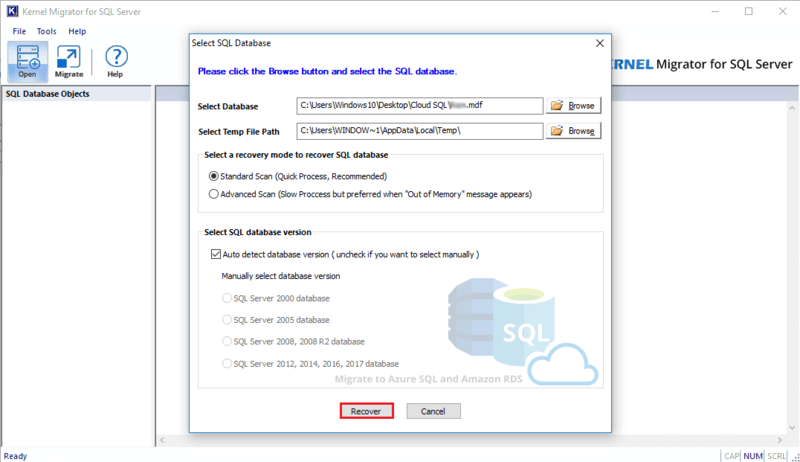 Can I migrate SQL Server database files of any size? Yes, SQL Migration tool has no limitations on the size of the SQL Server database file. You can migrate even large SQL database files to the destination using this tool. 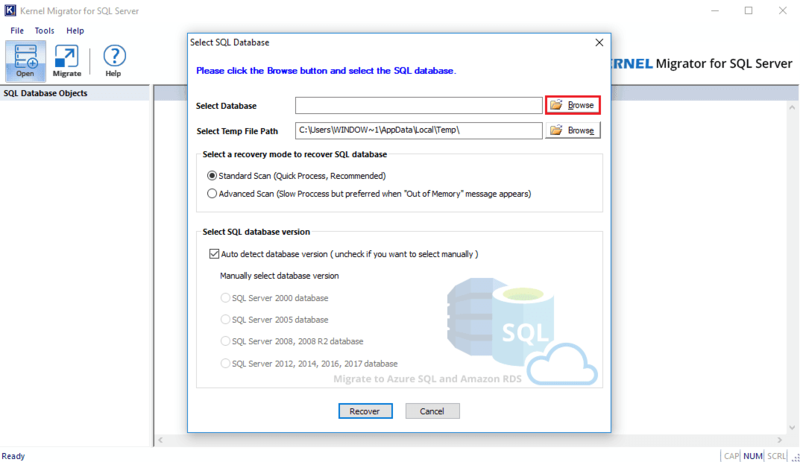 Can I migrate my SQL data to a new database in Azure SQL Server? 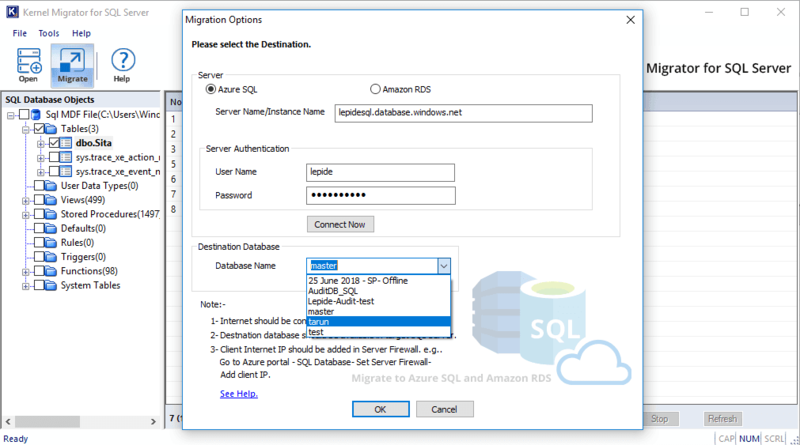 Yes, you can definitely migrate to a newly created database besides migrating to an existing one (both in Azure SQL Server and Amazon RDS). SelectSelect the SQL Server MDF files you want to migrate. PreviewSelect the desired SQL Objects on the left-pane and preview them. SaveSelect one out of the two saving options, provide the credentials and save the data. Browse the MDF file you want to migrate. Get the preview of the recovered MDF database file. Connect the destination SQL Server with valid credentials. Select the desired database for the MDF file. Database file is successfully migrated. I have used this software to migrate few MDF files to cloud. The best part I liked about the tool is that if you want to migrate corrupt SQL database files, then you do not need to repair them first and them migrate. 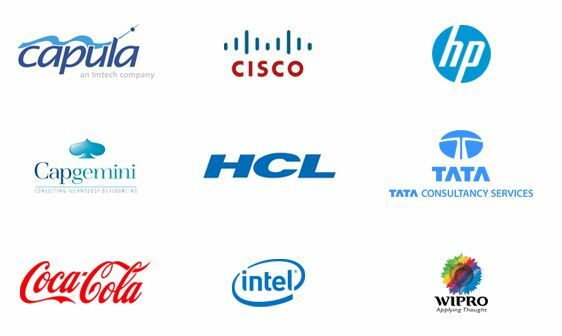 You just need to migrate the repairing process will be done on the software itself. This tool not only migrate and repair SQL Database files, but also the preview feature of the tool is the best part. I found no change in the original and migrated data, everything was on place and in exact hierarchy it was before migration. Thanks for this wonderful tool. I wonder, how time saving and feasible solution it actually is if you are looking to repair and migrate your files. It performs both of the actions very smoothly and let you focus on other important tasks. I liked the simple steps the whole procedure follows, even I was able to use it without having much technical knowledge.